How valves sound is a question we are often asked here at HFC. We thought we would start the ball rolling with the 6L6s tube comparison session. Let me introduce our new recruit - Elliot Leech. Recently graduated from the Liverpool Institute of Performing Arts, Elliot is a talented individual, having already worked as a producer/session player/audio engineer with artists from Boston to Madrid. These are what the amp came with, and as a blues amp I can understand why; a slight top end roll off helps defines the mids and low end, with the mids in particular being pushing through nicely. On the clean channel it gives the amp a nice warmth, maybe lacking a little definition, but giving the warmest top end of all the tubes tested. Switch to the gain channel and (as many who have read about or played this amp will testify to) it becomes quite muddy, certainly not unusable but lacking in definition across the EQ and especially loose in the low end. These particular tubes have been ‘worn-in’ a tad, as they were the tubes in the amp when I brought it and have been gigged plenty since, which I take into consideration as the overall sound they produce is slightly dull, to be expected with well-lived tubes. These tubes added lovely clarity to the amp, with bright but not brittle top end, balanced mids and ever so slightly boomy low end (which is easily sorted out by adjusting the EQ, but for consistencies sake in this test was left at 12). Pick attack shone through, helping the characteristics of the tele come to life. Switch to the overdrive channel and the top end is smoothened out, giving rich top end and clarity whilst retaining a warm low-mid. The low end is again a tad flabby, but as mentioned earlier droping the bass and pushing the mids slightly with the EQ solves this. Adds its own colour to the sound but delivers a very versatile range of tone and is easy to dial in, good all-round tubes that may well be my go-to budget tubes from now on. The first thing that was noticed with these tubes in was the pick attack, the definition of each note really shines through, something that I put down to the chimey (borderline brittle) top end these tubes give out. Jumping to the drive channel gives a similar result, tighter low end than some of the other tubes tested but a top end that is again teetering on the verge of defined/harsh. That said rolling back the tone (or again resorting to that handy EQ section most amps come with) tames the top end, resulting in a warm, defined sound. Brighten up the tone, would match well with darker/mid-pushed amps to bring in pleasant brightness or a player wanting more definition in a band mix. The emphasised mids of the other tubes wasn’t as apparent here, giving a full low end and clear, glassy top end, I felt they give a true representation of the amp they’re in, not adding to much of their own identity but instead highlighting the amps own colouring. Running through the drive channel these tubes really wake up the amp, being full bodied and retaining that glassy top end, but without losing note definition. Would suit higher-end/boutique amps, as transparent and highlight the natural qualities of the amp. First off, these tubes instantly have something about them, they toe the balance between warmth and harshness with finesse, and tame the muddiness that often needs EQing out of this particular amp. Pick definition shines through for single line runs and riffs, giving plenty of attack without dominating the sound, and strummed chords open up across the frequency range. Swapping to the gain channel tightens up the lows and produces chime like highs that again toe the line between clarity and harshness extremely well. Instead of using the EQ section to dial the amp into a sweet spot, these tubes let you use the EQ to make the sound sit where you want it, something I’ve not experienced with amps at this price point. 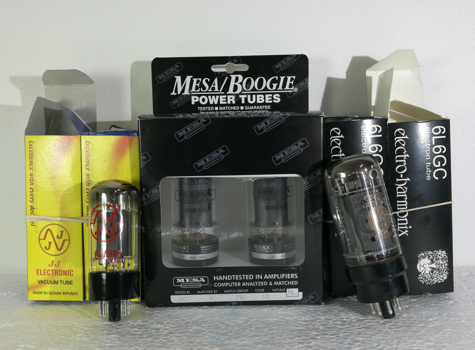 These tubes would suit most amps, being largely transparent yet bringing real life to an amp that can sometimes be difficult to dial in; these were the tubes I left in the amp.